January | 2013 | What Next? What does my husband Dave have on his nose? It is a boot. A boot from a saguaro cactus. 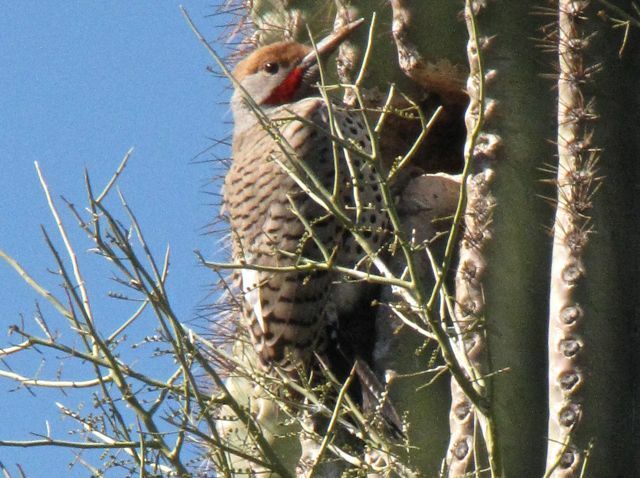 When birds like gila woodpeckers build nests in saguaros they chisel out holes in the cactus. The nest cavity is fairly deep so the baby birds will be hidden from view after they hatch. 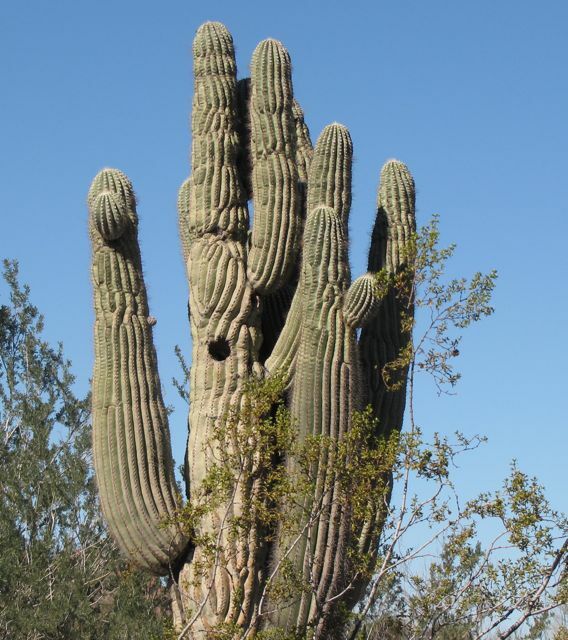 The saguaro creates a kind of hard callus around the wound created by the nest cavity. Since the bird has damaged it’s tissue the cactus must protect itself. 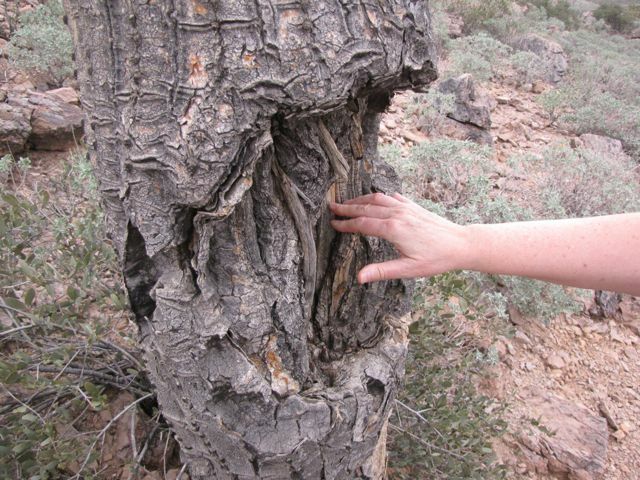 So it secretes a resinous sap that, over time, hardens into a bark-like shell that prevents the cactus from losing fluid and also protects the nest hole by making it waterproof. You can see a nest hole in this saguaro. 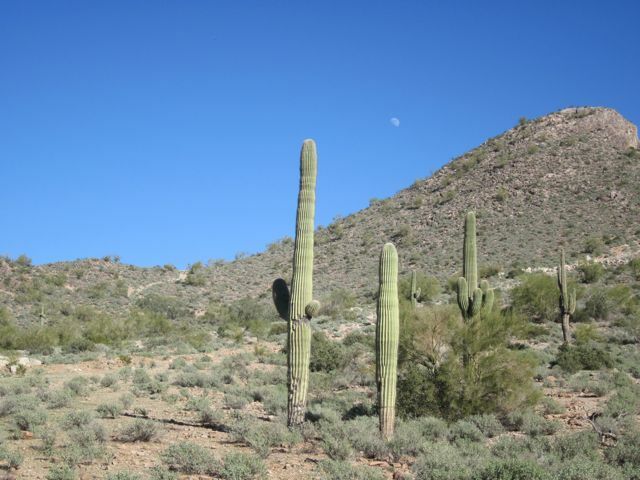 When the saguaro dies and its soft outer flesh rots the hard callus remains behind in the shape of a boot. Long ago native Americans used these saguaro boots for storage containers. 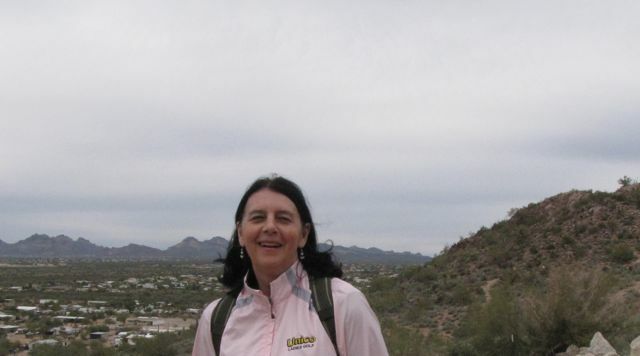 We learned about saguaro boots on our visit this week to the Phoenix Desert Botanical Garden. I was lucky enough to get a couple of photos of a woodpecker at work building a nest in a saguaro cactus as we walked along the trails. We learned lots of other cool things at the Botanical Gardens which I will write about in other posts. Think this is a stack of old comic books? Think again. 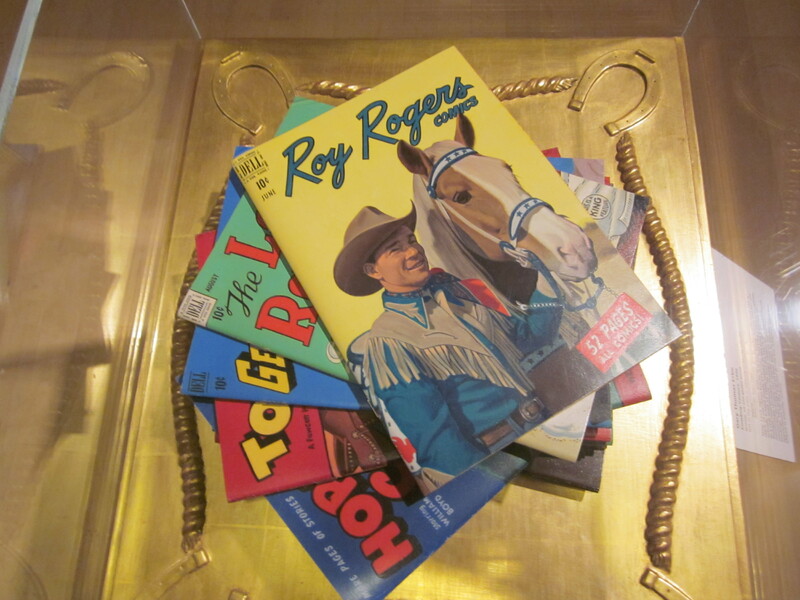 It is really folded sheets of bronze the artist painted to look like a stack of 1950’s comics. 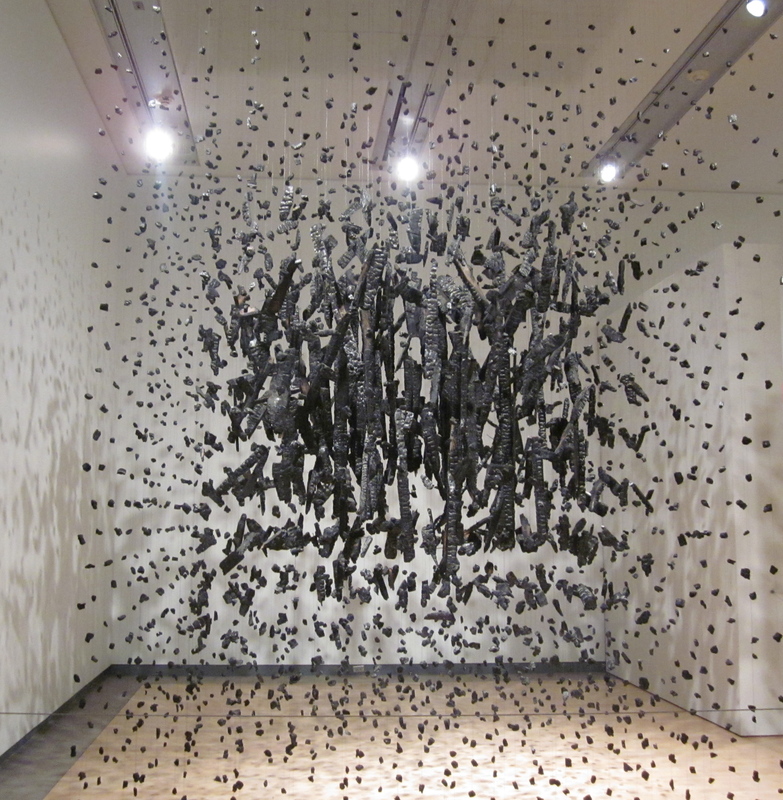 On my visit to the Phoenix Art Museum I saw art made from so many interesting things. Thousands of cruzeiros, a worthless currency used in Brazil till the 1980’s, were used to create a snake-like art piece. 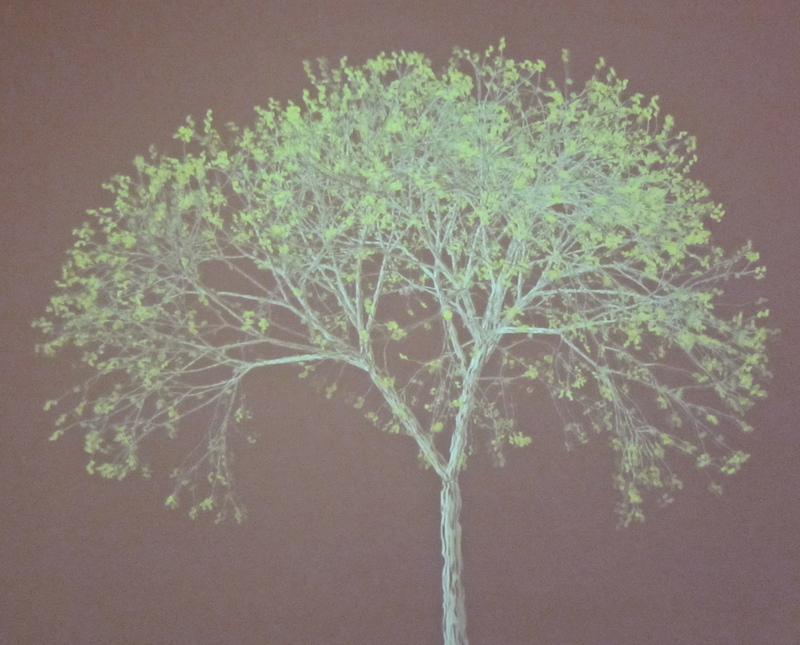 I stood for a long time watching a computer digital projection which shows a wind- blown tree changing with the seasons. 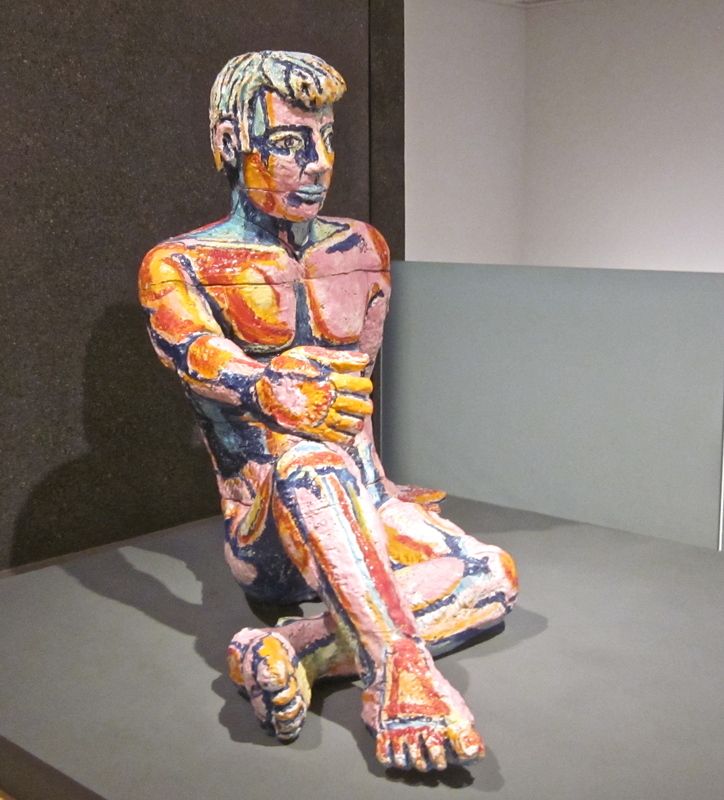 Viola Frey makes giant ceramic images of men and women that a New York Times reviewer calls kitchy and compelling. The charred remains of a Texas Church struck by lightening were used to create a thought-provoking installation. 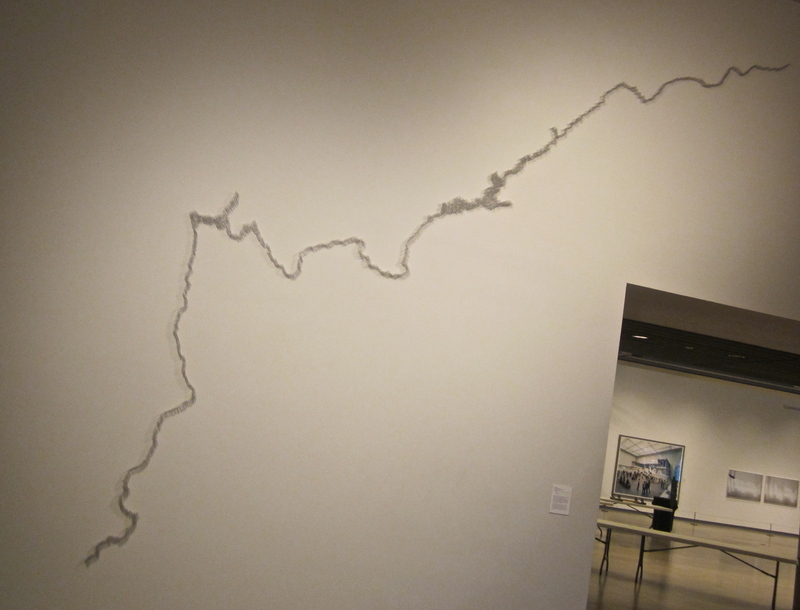 The map of the Colorado River has been outlined with thousands of silver pins. I enjoyed watching a series of art films including Telephones which shows clips from lots of different movies of characters using phones. You can watch Telephones too. 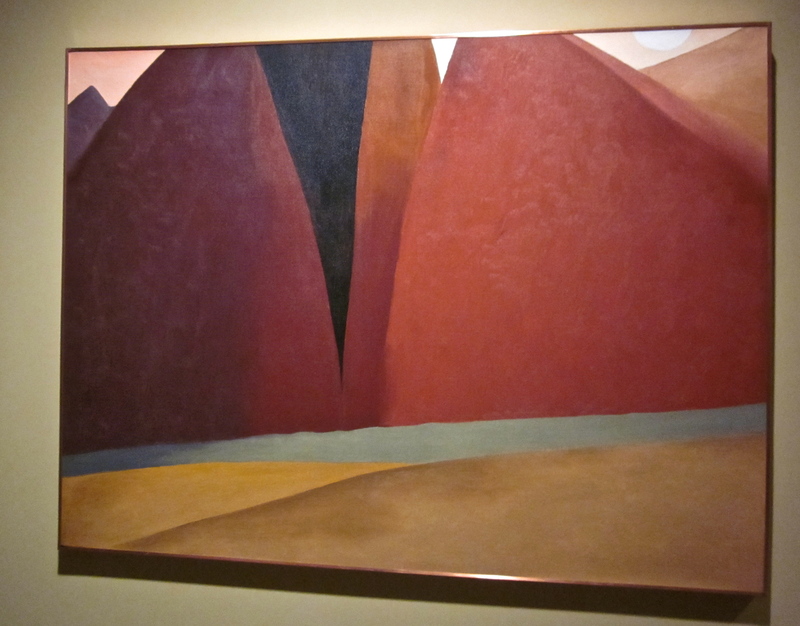 Of course there are plenty of traditional oil on canvas pieces in the Phoenix Art Gallery as well. 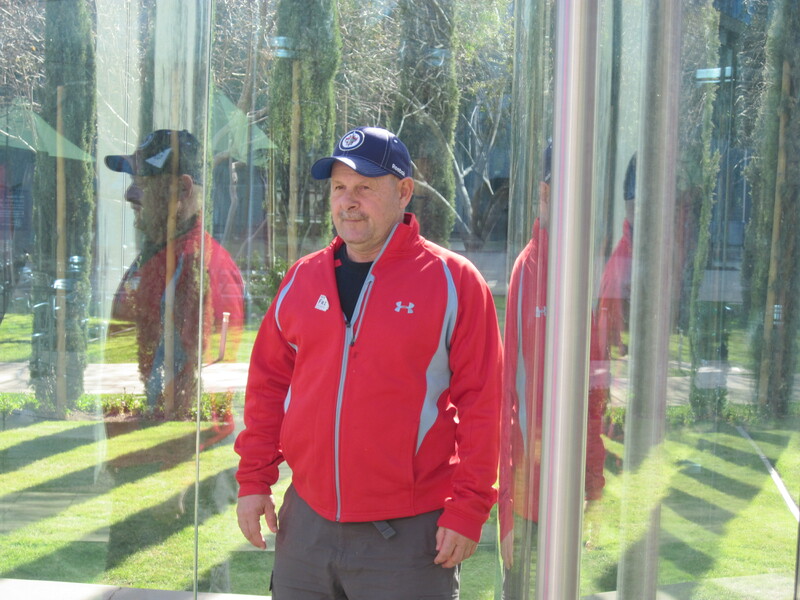 My husband Dave stands in an outdoor art installation by an American artist. It is made from two way mirror glass, stainless steel and slate. 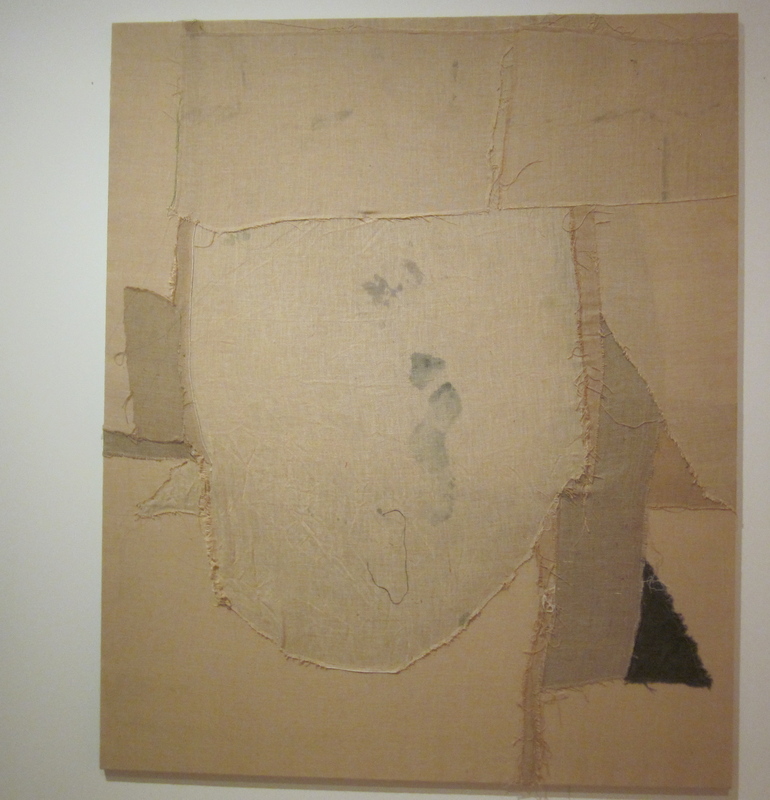 A Berlin- based artist used burlap to create an art piece. The scariest experience at the gallery is a dark room with mirrors on the floor, walls and ceiling. Dangling from the ceiling are strings of LED lights that dim and brighten.The installation is called You Who Are Getting Obliterated in the Dancing Swarm of Fireflies by Yayoi Kusama. So many different media have been used to create the work displayed at the Phoenix Art Gallery. It makes your visit interesting and intriguing. Professional racing cyclist Lance Armstrong was basically straight faced during his recent interview with Oprah Winfrey. He barely betrayed any emotion until he started talking about his children. Lance was describing how his son had been defending his Dad’s innocence to his classmates who were repeating the doping allegations reported in the news. When Lance discovered his son was sticking up for him, he knew he had to tell the truth about using banned substances to achieve some of his Tour de France victories. Lance’s voice quivered and tears filled his eyes as he described how he had told his son the truth. Lance’s reaction was a reinforcement of something I have long believed. Our children make us better people. We may be ashamed of something we’ve done in front of the whole world but nothing makes us feel so bad as letting our children down or having to admit to them we’ve been wrong. Many times my concern about what my children would think of me has guided my actions and decisions. I may have been tempted to do something I knew was unkind, dishonest or less than exemplary but then I’d stop and think about what my actions might do to my children’s image of me or to their concept of what was right and wrong. I don’t know how often I have been stopped in my tracks and prevented from doing something foolish because I considered whether what I was doing was something I would want my children to imitate. I can think of times when both my children have set me back on the straight and narrow by reminding me of things I had taught them but was forgetting myself. It is a humbling experience. Sometimes I sink into phases where I’m lazy about my health, community responsibilities, career goals or family commitments. Thinking about the kind of example I want to set for my children snaps me out of those indolent phases and gives me the inspiration to move on. I have failed many times at being a good human being, doing things that weren’t right or kind or honest. But I am absolutely certain that without my children there would be many more of those instances. I am a much better person because of my kids. We all reach the point in our lives when we realize our parents aren’t the perfect people we thought they were when we were small. However if we truly believe they love us and are trying their best to be good parents we can accept their imperfections and forgive them for the things we think they did wrong. Lance Armstrong says his son has forgiven him. According to the disgraced athlete his son said. “Look, I still love you. You’re my dad. This won’t change that.” Lance is a lucky parent to have such a child. Most children are very forgiving when their parents fail to be the kind of example they should. That unconditional trust should make us feel even more accountable to our kids and more mindful of our responsibility as parents to be good role models. Children are an incredible gift and they make us better people. I think Lance Armstrong has figured that out. Until he showed his vulnerability as a father in his interview with Oprah I had a hard time believing he was really sorry for what he had done. He clearly is deeply saddened by the impact his choices have had on his kids and that should give him hope that he can change for the better and live the rest of his life with a greater measure of integrity. I had never heard of kachinas till our family lived on the Hopi Indian Reservation for a year. My husband and I were teachers there. I learned about kachinas from my students and their families and from attending Hopi ceremonies and dances. Kachinas are spirits who live in the San Francisco Peaks and come to the Hopi villages at different times of the year. These religious beings are really Hopi males dressed up to look like the various kachinas. There are hundreds of different kachina spirits. At some dances I attended the kachinas gave out gifts or danced and at others they acted out plays that taught a lesson. I was always amazed at how even my grade one students could identify so many of the kachinas and would draw colorful and detailed pictures of the various kachinas. I even kept and framed some of their drawings. I was reminded of the things I had learned about kachinas when I visited the Heard Museum and saw their large collection of kachina dolls. Kachina doll carving is thought to have begun as early as 1300. The dolls were made by Hopi men as gifts for children to help them learn the names and attributes of the various kachinas spirits. I remember that my students thought of some kachinas as friendly but they were scared of others who were sent to mete out punishment to them if they had been bad. Young children didn’t know that the Hopi kachinas were really their fathers and grandfathers dressed up to look like the spirits. They believed the kachinas were real just like kids believe in Santa Claus. It was only when they reached age eleven or twelve that the boys went through an initiation ceremony in the kiva and were told the truth about the kachinas. 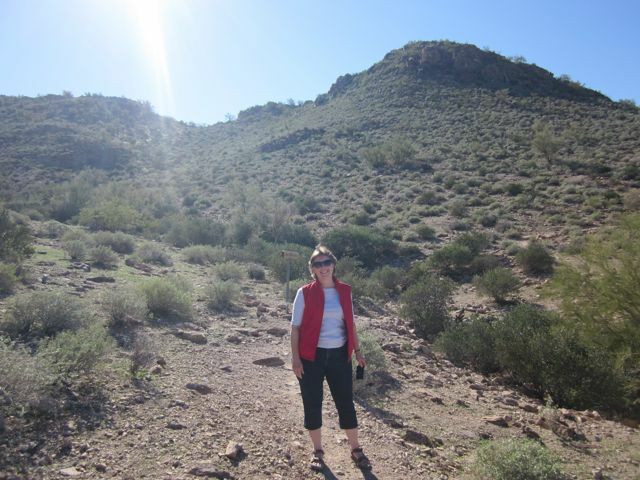 A kiva is an underground chamber where sacred ceremonies are held. 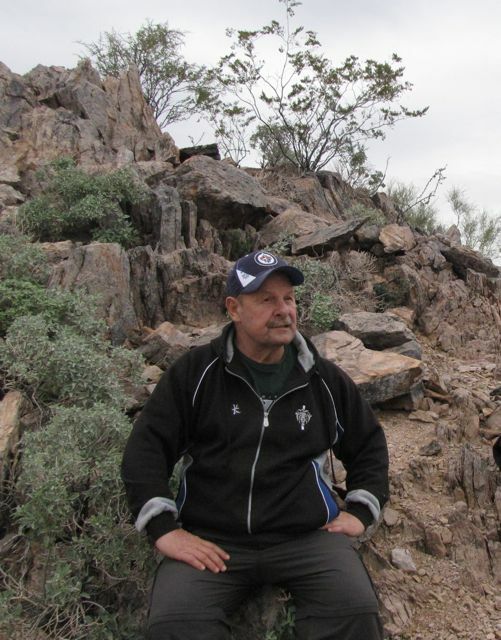 Since my husband taught grade six and was the basketball coach for some of the boys who were being initiated he was given the rare privilege of attending a Hopi initiation ceremony in the kiva as some of his students were initiated and found out the kachinas were really the men of the tribe dressed up in costume and paint. We did buy one kachina carving when we lived on the Hopi Reservation but it was from a beginning carver and unfortunately it has had some feathers broken during our many moves. The best carvers can charge thousands of dollars for their work and I read that one kachina doll sold privately for over $300,000. One of the guides at the Heard Museum said kachinas used to be carved very simply but in the 1960’s when art collectors began to show interest in them the artists started making them more colorful, often creating the dolls in an action pose. They also began to sign their work. Senator Barry Goldwater of Arizona had 437 kachina dolls and his collection is on display at the Heard Museum. Kachina dolls are made from the root of the cottonwood tree using various tools like knives, chisels, rasps, mallets and saws. Often the various body parts are created separately and then attached. Once the carving is finished the pieces are whitewashed and painted and various decorations added. I enjoyed finding out more about kachina dolls at the Heard Museum and remembering all the things I learned about kachinas during our year of living with the Hopi. 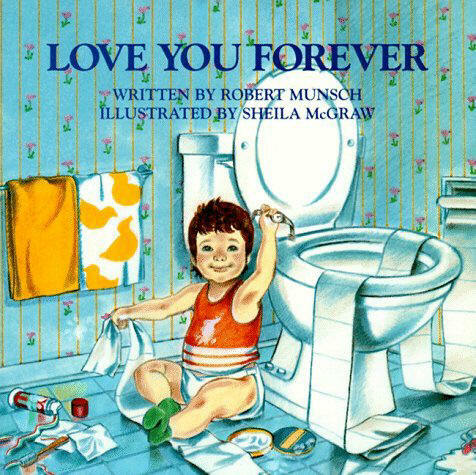 Why has Canadian author Robert Munsch sold more than 15,000,000 copies of his book I’ll Love You Forever? I explore that question in today’s post on Vast Imaginations. 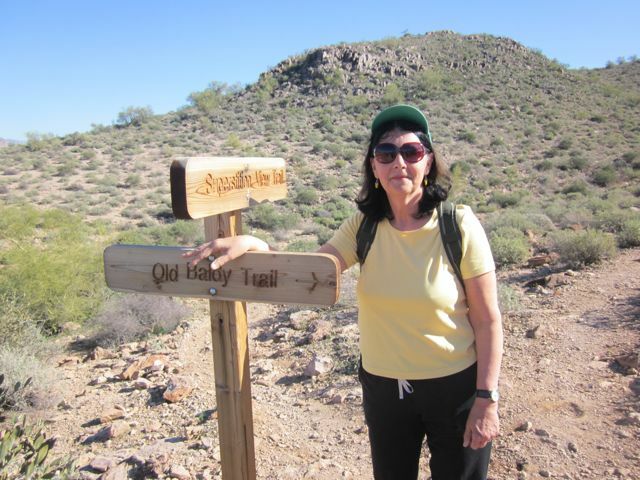 It is a blog I contribute to bi-weekly as a member of a writers’ group for children. 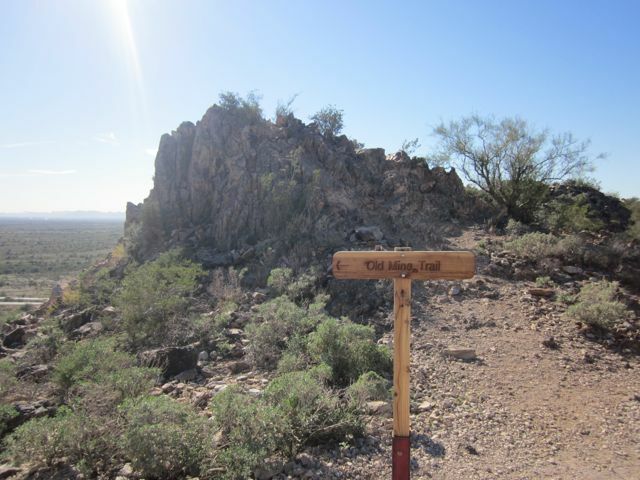 I’ve climbed Silly Mountain with three different companions since our arrival here in Gold Canyon Arizona. Silly Mountain seems like an odd name for a mountain but when I tried to find out how it got that designation all I could discover was that a road grader named Harry Cadwalader had a home on the road leading up to Silly Mountain and told his supervisor he’d like to name the road Silly Mountain Road and the supervisor agreed. 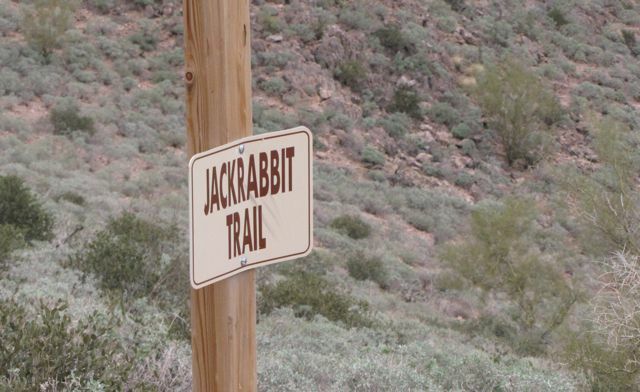 A little more creative thought went into naming the trails. There are lots of different ones to climb. Some are easy, some moderate and some difficult. 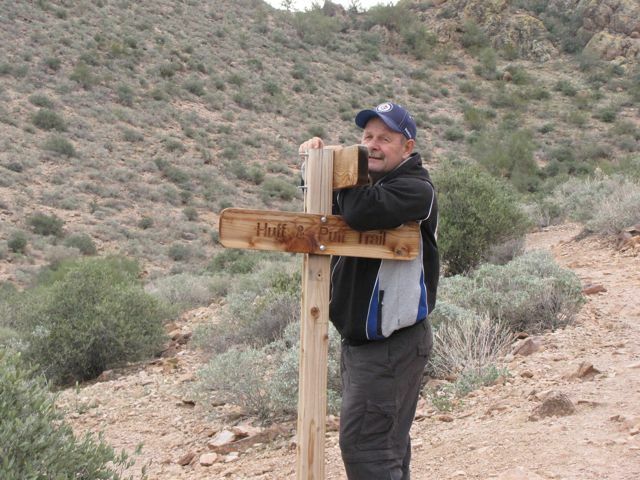 Here is Dave at the Huff and Puff Trail sign. 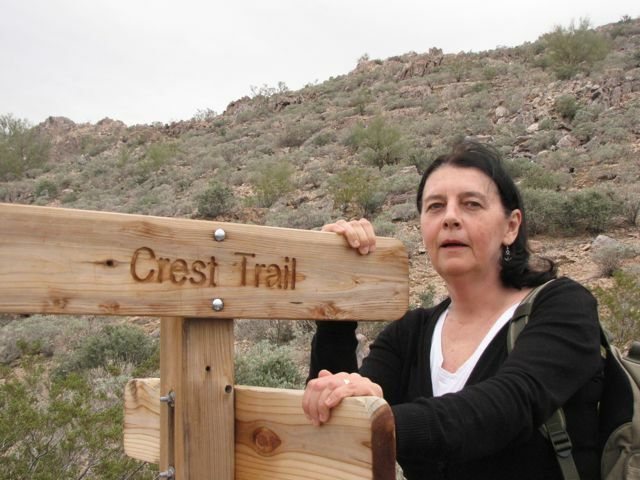 The Crest Trail and several others including Palo Verde and Coyote Loop. 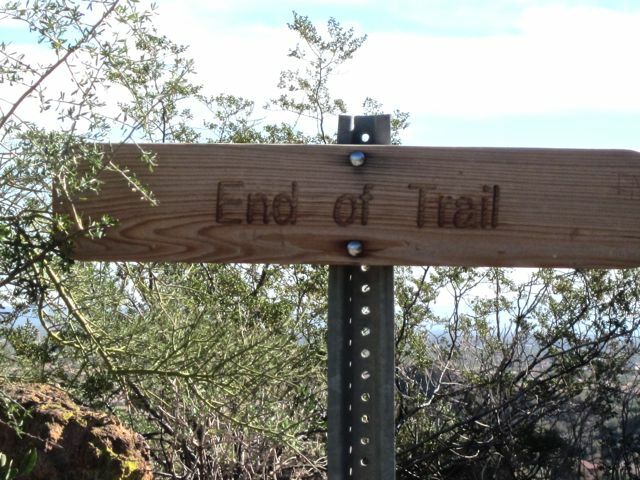 With so many trails you can get lost. 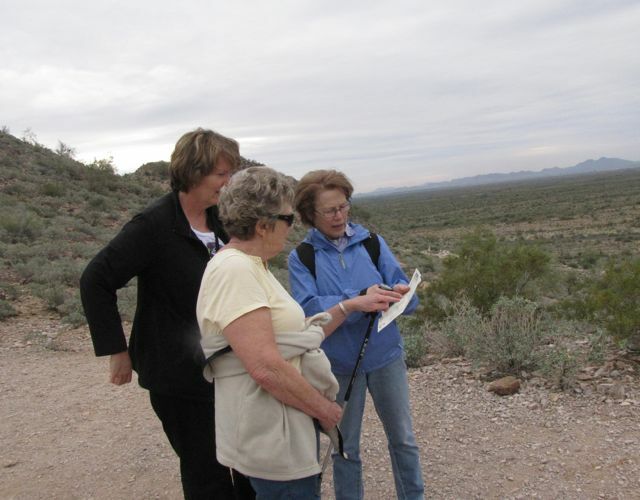 Here my friend Esther is consulting a map with two ladies we met from Minnesota on the trail. 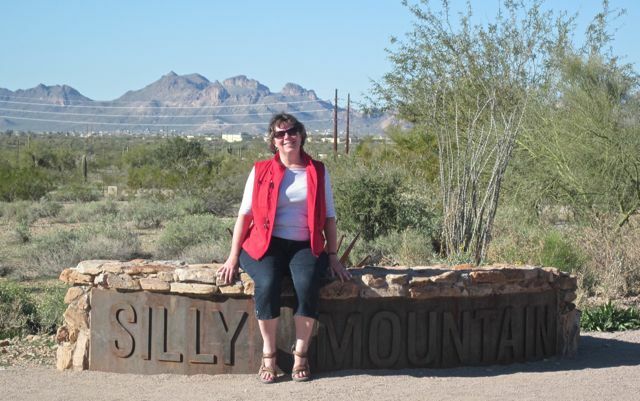 Silly Mountain is a popular hiking trail and guide books say up to 50 hikers at a time can be on the trail. 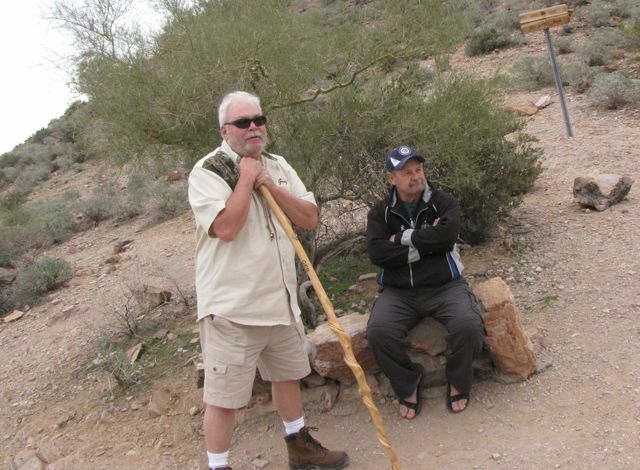 Since Dave had to wait for me to catch up at intervals he had time to strike up conversations with some of his fellow hikers. 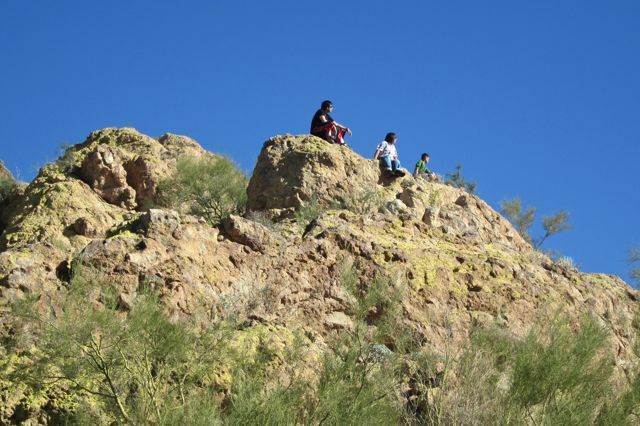 Kaaren and I hiked Silly Mountain on Martin Luther King Day, a school holiday so there were lots of families and kids out on the trails enjoying the near record-setting warm weather, including these three adventuresome teens who had left the path and scrambled up to the top of one of the rocky ridges. 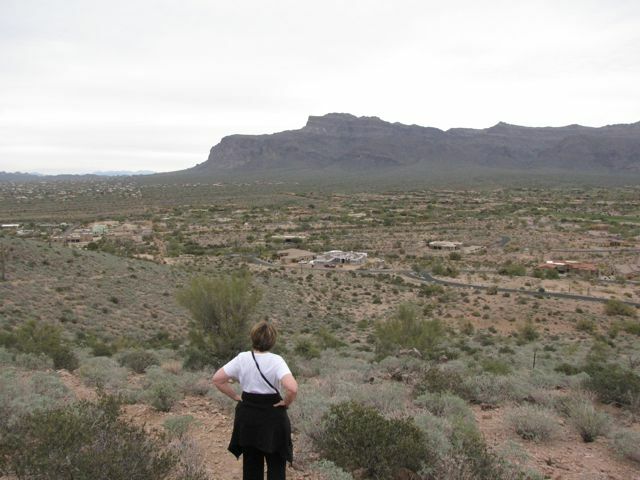 The views from Silly Mountain are definitely worth the climb. 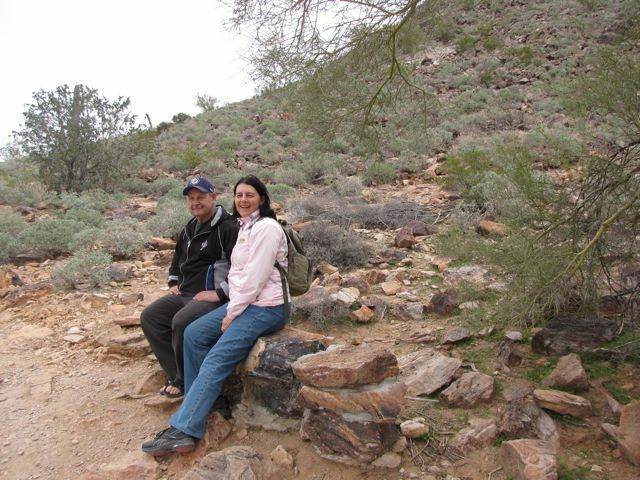 There are lots of beautiful cacti along the trails. 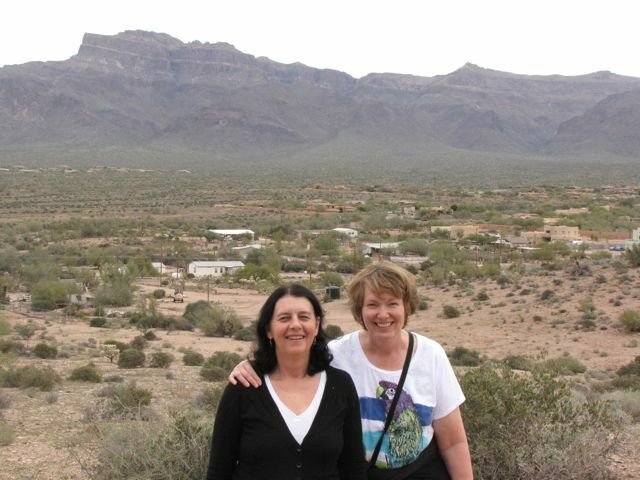 My daring friend Esther actually decided to put her hand inside a dying saguaro to see what it was like. She said it felt like wood. I’ve enjoyed climbing Silly Mountain with each of my companions. 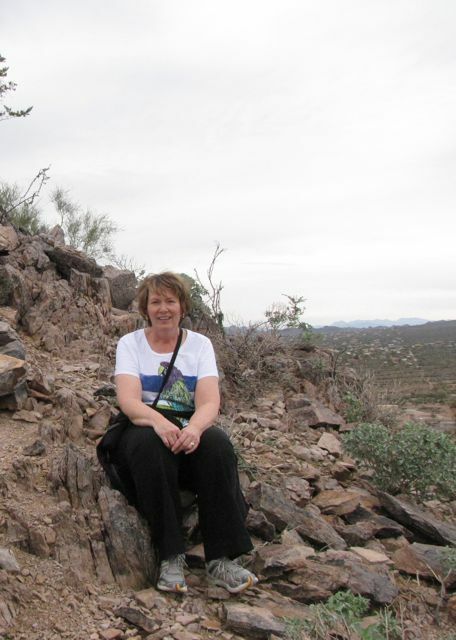 I wonder who’ll I’ll climb the mountain with next? 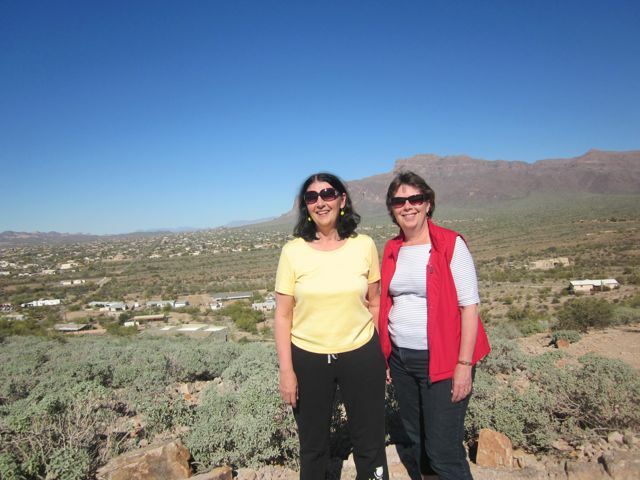 We lived and taught for a year on the Hopi Reservation in Arizona. 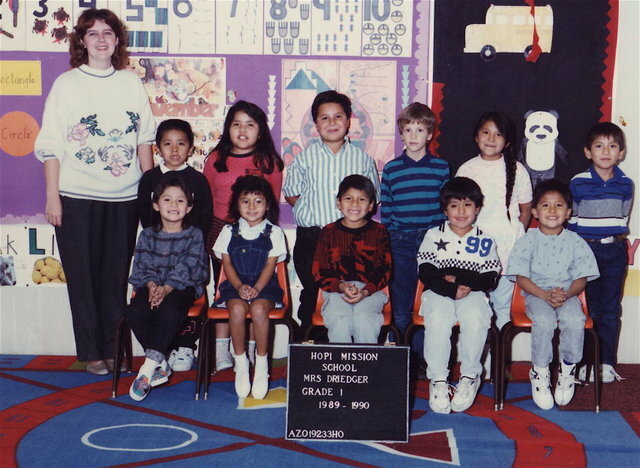 Here I am with my grade one students in 1990. Because of that experience the many exhibits about the Hopi culture at the Heard Museum in Phoenix were of particular interest to me. 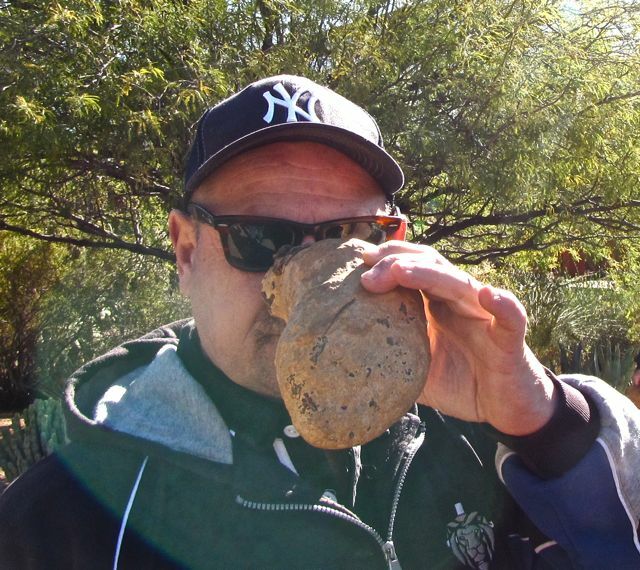 One favorite treat that my Hopi students often brought to school for a snack was piki bread. They had some on display at the museum. I really liked piki bread . It had a slightly sweet taste and was so much lighter than bread. Once my students knew I enjoyed it they often brought piki bread to school for me. 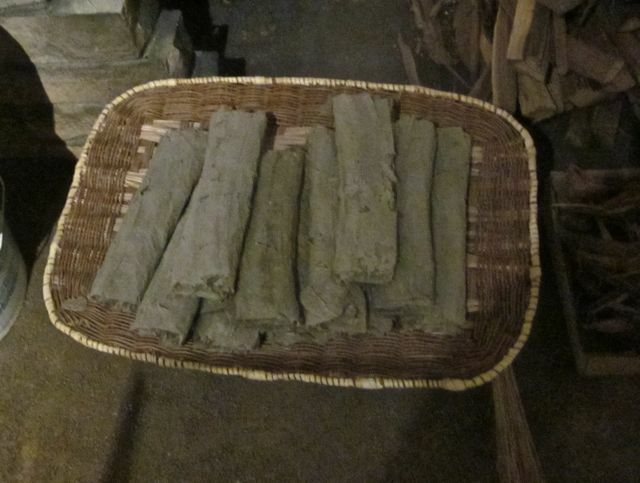 Piki bread is made from blue corn. The corn is harvested and taken off the cob. 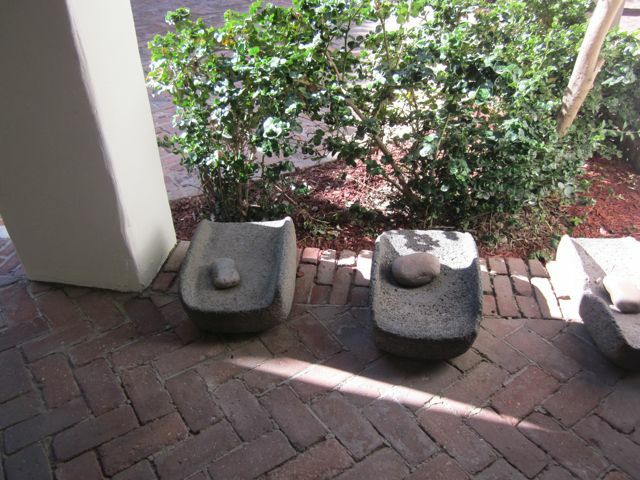 The corn is ground into meal using a grinding stone like these I photographed in the courtyard of the Heard Museum. I remember when we lived in Arizona one of the Hopi women let our sons who were ten and four try grinding the corn on one of these stones. It was hard work. The blue cornmeal is mixed with water and the burnt ashes of juniper trees. You can see the mixture in the bowl at the side of this photo. The Hopi women then use their bare hands to spread the mixture on a special baking stone that has a fire built beneath it. I watched this process quite a number of times during my year on the Hopi Reservation and I could never understand how the women didn’t burn their fingers when they were spreading the cornmeal paste on the hot stone. They were soooooooooo fast! The bread bakes quickly and once it starts to lift off the stone, the women roll it up. Hopi women have been making piki bread this way for hundreds of years. I don’t think you can buy it anywhere. I miss piki bread. It was delicious! It was nice to be reminded of piki bread on my visit to the Heard Museum in Phoenix. If you want to know more about piki bread check out this You Tube Video Making Piki Bread.